Global engineering company, Renishaw, collaborated with two innovative technology companies to demonstrate the capability of metal additive manufacturing (AM) technology to produce lightweight spinal implants that mimic the mechanical properties of bone. As part of the project, Irish Manufacturing Research (IMR) designed and manufactured a series of representative spinal implants. 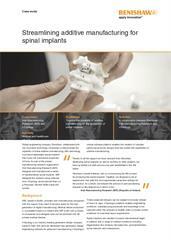 IMR designed the implants using software from nTopology and produced them on a Renishaw RenAM 500M metal AM system.